You may have heard that certain foods act as metabolism boosters, allowing you to burn fat faster. That's only sort of true. You may have heard that certain foods act as metabolism boosters, allowing you to burn fat faster. 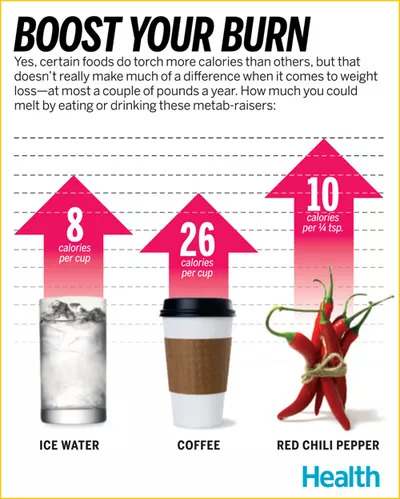 While that's sort of true: some eats do in fact torch more calories than others, it doesn't really make much of a difference when it comes to weight loss—at most a couple pounds a year. But hey, sometimes even the tiniest tweaks can be helpful. When you drink ice cold, zero-calorie water your body actually burns calories to keep you warm. And finally, yes, adding a little spice adds some very real burn: it heats up your body, so you torch more calories.